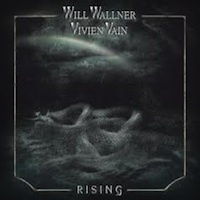 The British guitarist Will Wallner and Croatian singer Vivien Vain are based in LA and have release their debut album in Europe in October. Together with Carmine & Vinny Appice on the drums and a whole bunch of professional musicians (bassist Jimmy Bain and Rudy Sarzo while keyboards are contributed by Tony Carey and Derek Sherinian) 'Wallner & Vain' have created a hard rock disc in a old-school 80's rock style, but with a little heavier vibe. Vivien is never in a danger zone with her vocals, she is singing in the middle of the tone scale and doesn't challenge her voice into any high pitch. Elegant and well balanced melodies that feels well thought out and a fantastic guitar playing as seasoning. I love 'Dreamstealer' with masterfully musical craftsmanship from Will. The Appice brothers are contributing with amazing drum play in the heavy track 'Streets Of Rage', and it's one of my favourite songs on 'Rising'! The nine (I count only seven as real ones) tracks they've recorded leave me with a lot of respect and even though the album is clocking in just on rigid half-an-hour, it still has several golden moments to enjoy. Ear candy for guitar lovers and those who like technical melodic hard rock that requires a little wider, deeper taste. I can honestly admit that I did not like this CD after first listening, but after the third and especially after the fourth listening, I became convinced of its greatness. Really groovy and advanced thoroughbred hard rock for us guitar fans. The sharp guitar riffs and high-octane guest musicians mean this fine debut album finally takes off, despite a mediocre vocal performance and a very short playing time at a much higher rating than what I first typed in my early notes. The final song 'Indestructible' is a bold and modern rock tune that rounds off a charming and well-produced disc. I recommend the ownership of this disc!